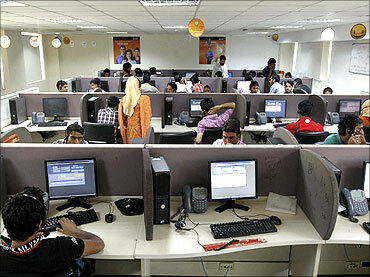 Job scenario in India is bleak due to various political and social reasons. Every year 12 million young Indians will arrive in the job market. I am constantly surprised at how often in conversations with thoughtful people this statistic is brought up: that, from now on for the next decade, every year 12 million young Indians will arrive in the job market. And this additional statistic is brought up too: that in the past few years, the organised sector in India, the sector that provides regular salaries and a modicum of medical and retirement benefits, has added almost no jobs in spite of the economy having grown quite healthily during that period. When the statistic about the surge of young people joining the workforce was first brought up, it was presented as a “demographic dividend”: young people joining the workforce would spend on housing, clothes and so on, thereby driving economic growth through their newly acquired shopping power. When the first signs of there being no jobs for all these people appeared, we turned a critical eye on our educational system: if these young people are not getting jobs, it must be because our schools, colleges, industrial training institutes and polytechnics must be doing a bad job. We thought that the answer lay in reforming curricula, motivating teachers and improving educational management. It is only now that the seriousness of the situation is dawning on us: you can improve school, college and vocational education and make them the best in the world but if there is no demand-side action – that is, demand for these students when they graduate and at salaries that are reasonable – students will not opt for these courses. Why is it that, for all the economic growth that India has seen in the last two decades, the only jobs that are available are in the “informal” sector — jobs such as those for drivers, maids, shop assistants, manual labourers, street vendors and garbage collectors? Peter Hall of Harvard and David Soskice of the London School of Economics, in their book Varieties of Capitalism: The Institutional Foundations of Comparative Advantage, provide us with a political economy approach to understanding such phenomena. They point out that countries like the United States and the United Kingdom on the one hand and Germany and Sweden on the other are both democracies and also practise capitalism, but they practise two different types of capitalism. Germany and Sweden are “co-ordinated market economies” whereas the UK and the US are “liberal market economies”. The institutional characteristics of co-ordinated market economies include “patient” capital; employment protection; industry-wide or even nationwide wage-setting practices; and a highly developed vocational education system, linked to a strong apprenticeship system based on strong links between firms, employers’ associations and unions. This system builds a skill profile that creates a competitive advantage in areas in which competition is based on incremental innovation; one such area is capital goods. Liberal market economies, on the other hand, feature arm’s-length provision of investment capital; low levels of employment protection; decentralised, firm-level, wage bargaining; and a training system in which students in schools and colleges are trained in general purpose skills, which are easily transferable across firms and industries. Such a regime adapts quickly to changes and situations that demand radical innovation, such as is characterised by industries like communications and finance. In other words, there is an intricate link between the type of investment capital, the level of employment protection, the wage-setting system and the skill formation system — these factors interact and create the kind of competitive advantage and, thus, the kind and scale of jobs in a country. Viewed through this political economy lens, some of the mysteries of India’s economy and job creation challenge become a little less mysterious. For instance, in India, there are almost no institutions for supplying venture/risk capital (this explains why the vast majority of businesses are owned by entrepreneurs from business families). The government (central, state, local and public sector undertakings) is by far the largest employer; job security is guaranteed for government employees, and their wages are set through once-in-10-year Pay Commissions with a very tenuous link between performance and salary growth. Skill formation is based on a general skills-based school and college system, in which good-quality institutions are few (missionary-run at the school level and government-run at the higher education level) and low-priced, and access is based on family contacts (at the school and undergraduate level) and on brutal entrance exams at the higher education level. A poster child of this system is the prestigious Indian Institute of Technology (IIT) system, in which the tutorial colleges that prepare students for the IIT entrance exams had, last year, a revenue of Rs 8,000 crore ( Rs 80 billion), many times the fees of all the classes of all the IITs put together. Is this configuration of India’s political economy what lies behind our economy: a challenged manufacturing sector; a large government sector; a sizeable offshore services sector that, like the government, provides routine, repetitive task-oriented jobs; a family-dominated trade and the services sector; and an ever-increasing low-wage informal sector? And is this also the reason why we have no answer yet for the 12 million young Indians arriving each year hungry for a job at a decent wage? Can Modi defuse India's jobs time bomb?